As online advertising approaches its 18th year, it’s still striving to create the powerful impact of some of the classic television campaigns from the early years of advertising. Still remembered today, these iconic ads were able to engage, enthuse, and influence audiences in ways that digital campaigns have yet to achieve. In an effort to inspire the ingenuity of the past among today’s digital creatives, Google initiated “Project Re: Brief.” This was an effort to re-imagine some of our all-time favorite campaigns from the 1960’s and 1970’s by enlisting the help of their legendary creators and utilizing the latest digital technology to adapt their original ads for the Internet. After all, to come up with great digital advertising, you need to first come up with great advertising. Google chose some unforgettable campaigns for Alka-Seltzer, Coca-Cola, Volvo, and Avis. To re-imagine Alka-Seltzer’s “I Can’t Believe I Ate The Whole Thing” campaign from 1972, Google convinced its copywriter, Howie Cohen, and art director, Bob Pasqualina, to emerge from retirement to give “Ralph,” the ad’s overstuffed character, a renewed relevance while re-branding the company for the digital age. 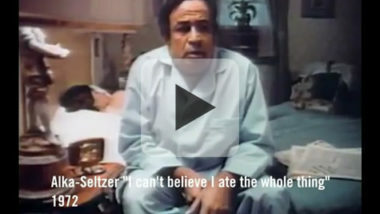 The original TV commercial featured Ralph, a man who overeats and can’t sleep, complaining to his wife, “I can’t believe I ate the whole thing.” In an effort to get some sleep herself, she tells him to take two Alka-Seltzers and the ad shows the classic image of the tablets plopping and fizzing in a glass of water. It was a true-to-life scene that millions could relate to and one that ingrained the message that Alka-Seltzer was the solution for indigestion and heartburn. Ironically, the concept for the ad came from the personal experience of Mr. Cohen when he overate one night and uttered that soon-to-be famous phrase of fullness to his wife. She casually joked how that could be his next Alka-Seltzer ad and the campaign was born. It immediately resonated with audiences and sales of the remedy soared. Now 40 years later, that famous phrase is still a part of pop culture and continues to be uttered after eating extravaganzas all over the world since it’s a feeling that is universally relatable. The re-imagined version revisits the original ad to tell the story of the events leading up to Ralph’s eventual indigestion. Mr. Cohen, Mr. Pasqualina, and the Google team structured the ad like a 1970’s sitcom to chronicle Ralph’s day through a series of episodes about his breakfast, lunch, and dinner using online display ads and mobile messaging. The episodes can be customized according to the viewer’s interests, location, and time of day. For example, the breakfast episode is featured when viewed in the morning. In addition, each episode can be altered by the viewer to provide real interaction, such as calling Ralph on the phone via an online display ad. These customizable features make the episodes more fun, relatable, and engaging to evoke a bond with the character and a satisfying experience with the brand. After the ad is over, viewers can continue to follow Ralph’s daily eating experiences through the Google+ page established for this classic character. This new version of the ad is able to engage and immerse viewers in the life and meals of Ralph by taking a digital approach to building a personal connection. To see how Mr. Cohen, Mr. Pasqualina, and Google recreated Alka-Seltzer’s “I Can’t Believe I Ate The Whole Thing” campaign, click to see the following video, directed by Doug Pray. If you are ready to implement innovative creative ideas that will drive brand awareness in the digital marketing space, contact MDG Advertising at 561-338-7797 or visit mdgadvertising.com.